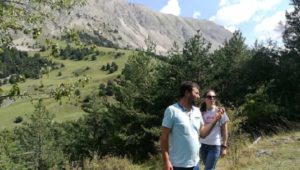 On 19 August 2018, Euromontana’s Director met Laurent Garde, Deputy Director of CERPAM (Centres d’études et de réalisations pastorales Alpes-Méditerranée) and Michel Pelestor, breeder and President of the Groupement Pastoral, manager of the Pompe Alp in the Alpes-de-Haute-Provence in France. During this meeting, the farmer explained his vision to make lamb meat, under a quality label throughout the year, as well as the means and strategy used to protect his herd, in a context of wolf predation. You can find here the minutes of the meeting (in French), written by Laurent Garde.